Your opinion matters. Leave A Review Or Edit This Listing for Reaching-Out Community Services. We recently converted to a tech ordering system. Our clients come to the food pantry, place their order on the touch screen ordering system, and their order is fulfilled by staff. PROOF OF ADDRESS: Utility Bill of any kind, SSI Form. With Your Name on it. PROOF OF ADULTS OR CHILDREN: Benefit Cards, Birth Certificate, etc. You will asked to explain your financial Situation. The reason for this information will allow us to operate this program more effectively without discrimination. If you don't have any of the above information or forms please explain your problem to our intake clerk. Best to call before visiting us to ensure we serve your zip code area. We always need more information on our pantries. 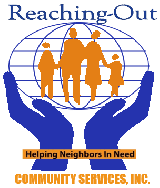 If you know of any details, volunteer information, website, hours or more description information about Reaching-Out Community Services please add a comment (below the map on this page), with information. We will then display this for all visitors on this page.